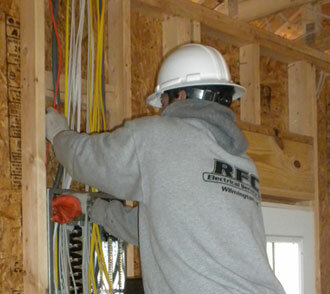 About RFC Electrical Service, Inc.
RFC Electrical Service, Inc. is a fully licensed and insured electrical contractor in Wilmington, North Carolina. RFC's founder and president, Russ Carlson, is a veteran to the electrical business with over 15 years of experience. Along with Russ, RFC's professional team is committed to meeting and exceeding customer needs and bases its business on the following principles. Our dedication to detail and genuine interest in doing great work have resulted in a large percentage of repeat customers and referrals. If you have a project or need more information please contact us and let us show you the RFC difference. ©2019 RFC Electrical Service Inc. | Electricians Wilmington NC | Call 910-520-3722 to schedule your free estimate.